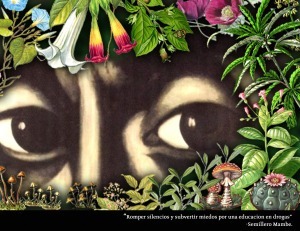 El Collectivo Ambiente de Tabanoy (CAT): Social Ecologists in Columbia link indigenous medicine, permaculture, and the call for communal politics. The Collectivo Ambiente de Tabanoy is a popular education project dedicated to sharing social ecological principles in Cristobol, Columbia. Cristobol is a suburb of the capital city of Bogota with many indigenous, peasant and worker communities. For over six years, these edukadores de kalle [street educators] have been organizing education and cultural programs which link social and ecological issues. Through these programs, the CAT serves as a watershed for activism throughout the region. One of the CAT’s main issues is local food production. They focus on articulating and sharing alternatives to the dominant model of industrial agriculture, seed privatization, pesticides and GMOs. They advocate a model of re-existencia; food cultivation which incorporates ancestral knowledges and expertise with clinical medicine and scientific methods. The practice of re-existencia complements directly-democratic social and political life. Through their education programs, the CAT addresses some of the most pressing social issues in Cristobal – poverty, the dispossession of land, and drugs. For example, they do this by teaching the history of pharmacology and chemistry and linking it to the political story of colonization and dispossession in Columbia. The CAT host communal discussions about the politics of memory, reconciliation and local struggles for defense of the land, and political liberation. Through understanding of the local, national and global history, the CAT propose a collective politics, in harmony with the social and natural world. Ultimately, their goals are to activate collective consciousness in the city and defend life. For more information (in Spanish), check out their website: https://colectivoambientetabanoy.wordpress.com/.